As we approach the time that I must move from this place I enjoy the rides in the woods a bit more. No idea how, because they basically gave me a new lease on life when I got here a few years ago. 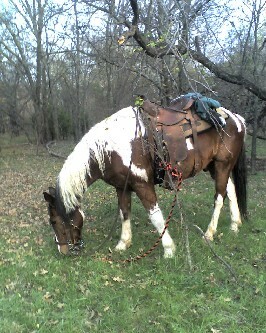 Cherokee and I spent hours both at sunrise before work and well after sunset negotiating the woods. The shot below was taken on one of those quiet solo rides in the chill of early winter. There’s just something inviting about a dim unexplored patch of woods. Together we’ve found a lot of those. Anyway, got to thinking about my workday and the realtime demands that keep you from wandering off and exploring. Reminded me of something I read long ago… one of those poems everyone sees as a kid shortly after the point where they finally get to quit reading “See the cat run? Run, cat, run”. I can identify. Been a lotta times I’m pretty sure Cherokee looked back with a “What were you thinking?” look when I tarried in some odd place. Anyway… work is a good thing. In our current economy nobody in his right mind complains about *having* to do it. We’re thankful, it keeps bread on the table. Still, there’s the trade-off shown in the words above. Not a complaint, just an observation. There’s still light out for about an hour… and that patch of winter rye up there oughta be in good form about now. Maybe it’s time to saddle up. Hope your day ends as nicely. Hi Rob, I came wondering over from V7N since you quoted one of my favorite poems. Actually, my favorite poem. The last paragraph is one of my mantras when faced with hard work and long nights. So you had me with that first post but kinda lost me with the one below. I’m a card carrying life long liberal who thinks the government should stay out of the bedrooms of it’s citizens. I think the government should stop fighting its own citizens. If Americans want to smoke weed, why not tax it and allow it? We can pretty much solve most of the current state budget crises by letting the dopeheads out of prison and collecting taxes on them. And if someone wants to pray thats fine, but the conservatives seem to want to transform us into a country in which prayer is part of our system. etc etc. In short, that humor is funny but it’s a of course a one-sided diatribe from the right. Nevertheless, a nice blog. I’d vote for you ahead of the last Bush but behind the previous one. But of course, I always vote the other way anyway so it’s academic. Hey Bat, thanks for your comment. I’m a fan of Frost, although Lewis Carroll is still my personal favorite. I’m a big fan of nonsense verse (Jabberwocky, The Capture of the Snark, The White Knights Tale, Walrus and the Carpenter) which probably says something about my character that’d be unpleasant, but what else is new. Fwiw, though I make fun of liberals regularly, I actually just do it as a public service to the ones that enjoy staying perpetually offended. Somebody has to give them a straight line, might as well be me. I’d vote to make it an Olympic sport (cause I’d love a gold medal and I’m too darned lazy to run track these days). That said, my own political leanings are libertarian, so getting the government outta bedrooms (dont they have their own?) and decriminalizing a drug thats probably a helluvalot less harmful than alcohol would fit my own opinions as easily as yours. Locking people up for pot is a wasteful, not to mention pretty obviously hypocritical in a nation largely fueled by beer and well drinks. Anyway… your opinions are always welcome here. Have a good one. Anyways, I love “The Road Not Taken” by Robert Frost (Posted below). Makes a lot of sense if you are in the right mood. Hey Lightless. Yep, that’s another good one. Frost is easily one of the standouts from that era. Hey Rob! When I was a kid I had a horse that I named Cherokee. I had another horse that was named Strawberry that looked very similar to the one you have pictured here. But all that was long ago, maybe more than 30 years ago!! I miss those days and I miss the rides we took through the East Ky hills.